From top left to clockwise: Downtown skyline, SkyDance Pedestrian Bridge, City Hall, Gold Star Memorial Building, Chesapeake Energy Arena, Oklahoma City National Memorial, state capitol. Oklahoma City is the capital and largest city of the state of Oklahoma. The county seat of Oklahoma County, the city ranks 27th among United States cities in population. 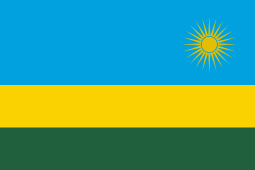 The population grew following the 2010 Census, with the population estimated to have increased to 631,346 as of July 2015. As of 2015, the Oklahoma City metropolitan area had a population of 1,358,452, and the Oklahoma City-Shawnee Combined Statistical Area had a population of 1,459,758 (Chamber of Commerce) residents, making it Oklahoma's largest metropolitan area. Since the time weather records have been kept, Oklahoma City has been struck by thirteen strong tornadoes: eleven F/EF4s and two F/EF5. 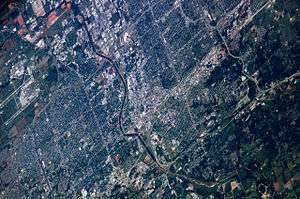 Mid-May 2006 photograph of Oklahoma City taken from the International Space Station (ISS). 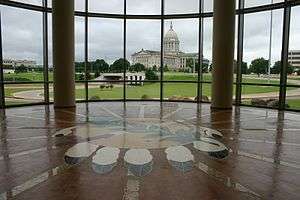 The city is bisected geographically and culturally by the North Canadian River, which basically divides North Oklahoma City and South Oklahoma City. The two-halves of the city were actually founded and plotted as separate cities, but soon grew together. The north side is characterized by very diverse and fashionable urban neighborhoods near the city center and sprawling suburbs further north. 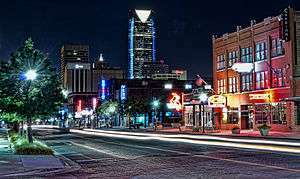 South Oklahoma City is generally more blue collar working class and significantly more industrial, having grown up around the Stockyards and meat packing plants at the turn of the century, and is currently the center of the city's rapidly growing Latino community. The report Regional Climate Trends and Scenarios for the U.S. National Climate Assessment (NCA) from 2013 by NOAA, projects that parts of the Great Plains region can expect up to 30% (High emissions scenario based on CMIP3 and NARCCAP models) increase in extreme precipitation days by midcentury. This definition is based on days receiving more than one inch of rainfall. Oklahoma City has a very active severe weather season from March through June, especially during April and May. Being in the center of what is colloquially referred to as Tornado Alley, it is prone to especially frequent and severe tornadoes, as well as very severe hailstorms and occasional derechoes. Tornadoes have occurred in every month of the year and a secondary smaller peak also occurs during autumn, especially October. The Oklahoma City metropolitan area is one of the most tornado-prone major cities in the world, with about 150 tornadoes striking within the city limits since 1890. Since the time weather records have been kept, Oklahoma City has been struck by thirteen violent tornadoes, eleven F/EF4s and two F/EF5. On May 3, 1999 parts of southern Oklahoma City and nearby suburban communities suffered from one of the most powerful tornadoes on record, an F5 on the Fujita scale, with wind speeds estimated by radar at 318 mph (510 km/h). On May 20, 2013, far southwest Oklahoma City, along with Newcastle and Moore, was hit again by a EF5 tornado; it was 0.5 to 1.3 miles (0.80 to 2.09 km) wide and killed 23 people. Less than two weeks later, on May 31, another outbreak affected the Oklahoma City area, including an EF1 and an EF0 within the city and an EF3 tornado several miles west of the city that was 2.6 miles (4.2 km) in width, the widest tornado ever recorded. In the 2000 Census, Oklahoma City's age composition was 25.5% under the age of 18, 10.7% from 18 to 24, 30.8% from 25 to 44, 21.5% from 45 to 64, and 11.5% who were 65 years of age or older. The median age was 34 years. For every 100 females there were 95.6 males. For every 100 females age 18 and over, there were 92.7 males. Oklahoma City has experienced significant population increases since the late 1990s. Since the official Census in 2000, Oklahoma City has grown 25 percent (a 125,214 raw increase) according to the Bureau estimates. The 2015 estimate of 631,346 is the largest population Oklahoma City has ever recorded. It is the first city in the state to record a population greater than 600,000 residents and the largest municipal population of the Great Plains region (Oklahoma, Kansas, Nebraska, South Dakota, North Dakota). Law enforcement claims that Oklahoma City has traditionally been the territory of the notorious Juárez Cartel, but the Sinaloa Cartel has been reported as trying to establish a foothold in Oklahoma City. There are many rival gangs in Oklahoma City, one whose headquarters has been established in the city, the Southside Locos, traditionally known as Sureños. The Oklahoma City Police Department, has a uniformed force of 1,169 officers and 300+ civilian employees. The Department has a central police station and five substations covering 2,500 police reporting districts that average 1/4 square mile in size. On April 19, 1995, the Alfred P. Murrah Federal Building was destroyed by a fertilizer bomb manufactured and detonated by Timothy McVeigh. The blast and catastrophic collapse killed 168 people and injured over 680. The blast shockwave destroyed or damaged 324 buildings within a 340-meter radius, destroyed or burned 86 cars, and shattered glass in 258 nearby buildings, causing at least an estimated $652 million worth of damage. The main suspect, Timothy McVeigh, was executed by lethal injection on June 11, 2001. It was the deadliest single domestic terrorist attack in US history prior to 9/11. According to the Oklahoma City Chamber of Commerce, the metropolitan area's economic output grew by 33 percent between 2001 and 2005 due chiefly to economic diversification. Its gross metropolitan product was $43.1 billion in 2005 and grew to $61.1 billion in 2009. By 2016 the GDP had grown to 73.8 billion. 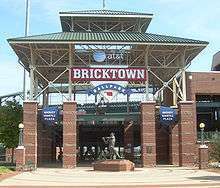 Chickasaw Bricktown Ballpark, home of the Oklahoma City Dodgers and the Big 12 Baseball Tournament. Other professional sports clubs in Oklahoma City include the Oklahoma City Dodgers, the Triple-A affiliate of the Los Angeles Dodgers, the Oklahoma City Energy FC of the United Soccer League, Rayo OKC of the North American Soccer League (NASL), and the Crusaders of Oklahoma Rugby Football Club of USA Rugby. The Oklahoma City Blazers, a name used for decades of the city's hockey team in the Central Hockey League have been reborn as a Junior A team playing in the Western States Hockey League. Chesapeake Energy Arena in downtown is the principal multipurpose arena in the city which hosts concerts, NHL exhibition games, and many of the city's pro sports teams. In 2008, the Oklahoma City Thunder became the major tenant. 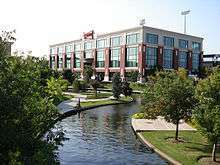 Located nearby in Bricktown, the Chickasaw Bricktown Ballpark is the home to the city's baseball team, the Dodgers. "The Brick", as it is locally known, is considered one of the finest minor league parks in the nation. The state of Oklahoma hosts a highly competitive high school football culture, with many teams in the Oklahoma City metropolitan area. The Oklahoma Secondary School Activities Association (OSSAA) organizes high school football into eight distinct classes based on the size of school enrollment. Beginning with the largest, the classes are: 6A, 5A, 4A, 3A, 2A, A, B, and C. Class 6A is broken into two divisions. Oklahoma City area schools in this division include: Edmond North, Mustang, Moore, Yukon, Edmond Memorial, Edmond Santa Fe, Norman North, Westmoore, Southmoore, Putnam City North, Norman, Putnam City, Putnam City West, U.S. Grant, Midwest City. Chesapeake Energy Arena, home of the NBA's Oklahoma City Thunder. The Oklahoma City Thunder of the National Basketball Association (NBA) has called Oklahoma City home since the 2008–09 season, when owner Clay Bennett relocated the franchise from Seattle, Washington. The Thunder plays home games at the Chesapeake Energy Arena in downtown Oklahoma City, known affectionately in the national media as 'the Peake' and 'Loud City'. The Thunder is known by several nicknames, including "OKC Thunder" and simply "OKC", and its mascot is Rumble the Bison. The Oklahoma City Thunder has been regarded by sports analysts as one of the elite franchises of the NBA's Western Conference and that of a media darling as the future of the league. Oklahoma City has earned Northwest Division titles every year since 2009 and has consistently improved its win record to 59-wins in 2014. 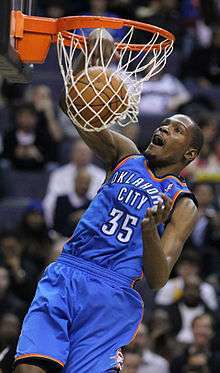 The Thunder is led by second year head coach Billy Donovan and is anchored by All-Star point guard Russell Westbrook. OU Health Sciences Center in Oklahoma City. The third-largest university in the state, the University of Central Oklahoma, is located just north of the city in the suburb of Edmond. Oklahoma Christian University, one of the state's private liberal arts institutions, is located just south of the Edmond border, inside the Oklahoma City limits. Due to Oklahoma City's explosive growth, parts of several suburban districts spill into the city, including Putnam City School District in the northwest, Moore Public Schools in the south, and Mid-Del School District in the southeast. The city boasts a number of private and parochial schools. Casady School and Heritage Hall School are both examples of a private college preparatory school with vigorous academics that range among the top in Oklahoma. Providence Hall is a Protestant school. Two prominent schools of the Archdiocese of Oklahoma City are Bishop McGuinness High School and Mount Saint Mary High School. Other private schools include Crossings Christian School. There are numerous community and international newspapers locally that cater to the city's ethnic mosaic; such as The Black Chronicle, headquartered in the Eastside, the OK VIETIMES and Oklahoma Chinese Times, located in Asia District, and various Hispanic community publications. The Campus is the student newspaper at Oklahoma City University. Gay publications include The Gayly Oklahoman. Despite the market's geographical size, none of the English-language commercial affiliates in the Oklahoma City designated market area operate full-power satellite stations to the far northwest part of the state (requiring cable or satellite to view them), though KFOR-TV, KOCO-TV, KWTV-DT and KOKH-TV each operate low-power translators in that portion of the market. 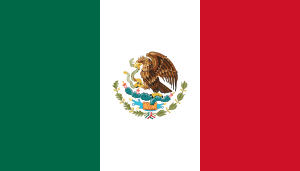 Oklahoma City is one of the few markets located between Chicago and Dallas to have affiliates of two or more of the major Spanish-language broadcast networks: Telemundo affiliate KTUZ-TV (channel 30), Woodward-based Univision affiliate KUOK 35 (whose translator KUOK-CD, channel 36, serves the immediate Oklahoma City area), Azteca affiliate KOHC-CD (channel 45) and Estrella TV affiliate KOCY-LP (channel 48). Oklahoma City is protected by the Oklahoma City Fire Department (OKCFD), which employs 1015 paid, professional firefighters. The current Chief of Department is G. Keith Bryant, the department is also commanded by three Deputy Chiefs, who – along with the department chief – oversee the Operational Services, Prevention Services, and Support Services bureaus. The OKCFD currently operates out of 37 fire stations, located throughout the city in six battalions. The OKCFD also operates a fire apparatus fleet of 36 engines (including 30 paramedic engines), 13 ladders, 16 brush patrol units, six water tankers, two hazardous materials units, one Technical Rescue Unit, one Air Supply Unit, six Arson Investigation Units, and one Rehabilitation Unit. Each engine is staffed with a driver, an officer, and one to two firefighters, while each ladder company is staffed with a driver, an officer, and one firefighter. Minimum staffing per shift is 213 personnel. The Oklahoma City Fire Department responds to over 70,000 emergency calls annually. Amtrak has a railway station downtown, with daily service to Fort Worth and the nation's rail network via the Heartland Flyer. Oklahoma City once was the crossroads of several interstate passenger railroads, but service at that level has long since been discontinued. Freight service is provided by BNSF and Union Pacific. Greyhound and several other intercity bus companies serve Oklahoma City at the Union Bus Station in downtown. Embark (formerly METRO Transit) is the city's public transit company. 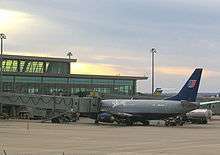 The main transfer terminal is located downtown at NW 5th Street and Hudson Avenue. Embark maintains limited coverage of the city's main street grid using a hub-and-spoke system from the main terminal, making many journeys impractical due to the rather small number of bus routes offered and that most trips require a transfer downtown. The city has recognized that transit as a major issue for the rapidly growing and urbanizing city and has initiated several studies in recent times to improve upon the existing bus system starting with a plan known as the Fixed Guideway Study. This study identified several potential commuter transit routes from the suburbs into downtown OKC as well as feeder-line bus and/or rail routes throughout the city. On December 2009, Oklahoma City voters passed MAPS 3, the $777 million (7-year 1-cent tax) initiative, which will include funding (appx $130M) for an estimated 5-to-6-mile (8.0 to 9.7 km) modern streetcar in downtown Oklahoma City and the establishment of a transit hub. It is believed the streetcar would begin construction in 2014 and be in operation around 2017. 1 2 "Oklahoma City". Oklahoma History Society. Archived from the original on April 12, 2016. Retrieved April 12, 2016. 1 2 "Population Estimates". United States Census Bureau. Retrieved May 26, 2016. 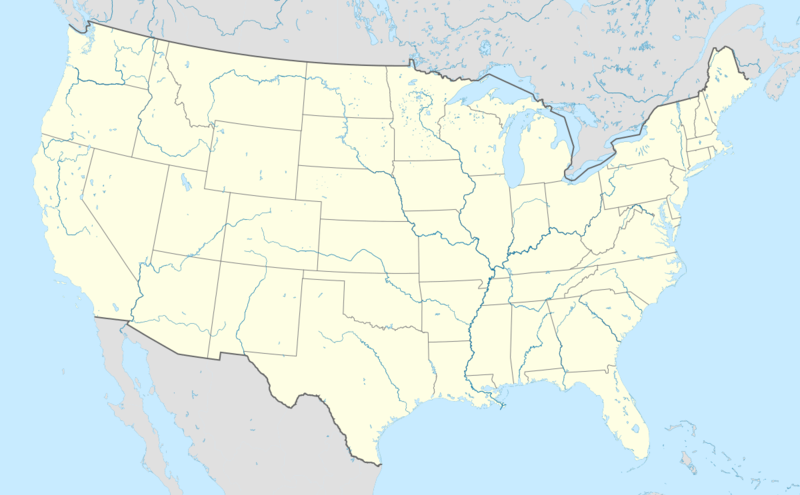 1 2 "Metropolitan and Micropolitan Statistical Areas". 2015 Population Estimates. United States Census Bureau, Population Division. March 24, 2016. Retrieved March 24, 2016. ↑ "Tornadoes Which Have Occurred in the Oklahoma City, Oklahoma Area Since 1890". National Weather Service Norman Oklahoma. Retrieved December 8, 2015. ↑ Wilson, Linda D. "Oklahoma City", Encyclopedia of Oklahoma History and Culture. Retrieved January 26, 2010. ↑ Curtis, Gene. "Only in Oklahoma: State capital location was a fight to the finish", Tulsa World. Retrieved February 4, 2010. 1 2 3 4 "Race and Hispanic Origin for Selected Cities and Other Places: Earliest Census to 1990". U.S. Census Bureau. 1 2 Dean, Bryan (December 28, 2012). "Former Oklahoma City Mayor Patience Latting dies at age 94". The Oklahoman. Retrieved January 11, 2013. ↑ "Criterion Group". OKCHistory.com. Retrieved October 20, 2009. ↑ "The Criterion Group, main page". The Criterion Group. Archived from the original on October 29, 2009. Retrieved October 20, 2009. ↑ "Baum Building". OKCHistory.org. Archived from the original on July 7, 2009. Retrieved October 20, 2009. ↑ "Hales Building". OKCHistory.org. Archived from the original on July 7, 2009. Retrieved October 21, 2009. ↑ Lackmeyer and Money, pp. 20, 42. ↑ "Biltmore Hotel". OKCHistory.org. Archived from the original on July 25, 2009. Retrieved October 20, 2009. ↑ Metropolitan Area Projects, Greater Oklahoma City Chamber. Retrieved February 5, 2010. 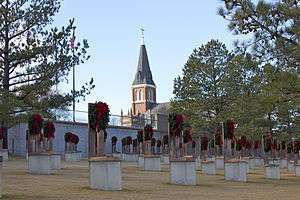 ↑ "Victims of the Oklahoma City bombing". USA Today. Associated Press. June 20, 2001. Archived from the original on February 27, 2011. ↑ "Oklahoma City National Memorial". National Park Service. Archived from the original on March 17, 2011. ↑ "Core to Shore at City of Oklahoma City". okc.gov. ↑ "About Oklahoma City". okc.gov. Retrieved 2016-02-25. ↑ Oklahoma Geography, NetState.com . Retrieved February 4, 2010. ↑ "Ecoregions of Oklahoma" (PDF). Retrieved September 24, 2008. ↑ History of the Oklahoma City Zoo, Oklahoma City Life Web site. Retrieved February 5, 2010. ↑ Elmias Thomas Collection Projects Series, University of Oklahoma. Retrieved February 5, 2010. ↑ 2008 Oklahoma River, City of Oklahoma City. Retrieved February 4, 2010. ↑ About, Modern Transit Project. Retrieved February 5, 2010. ↑ "Devon Tower". Emporis Corporation. Retrieved December 2, 2011. ↑ "Chase Tower". Emporis Corporation. Retrieved March 16, 2010. ↑ "First National Center". Emporis Corporation. Retrieved March 16, 2010. ↑ "City Place". Emporis Corporation. Retrieved March 16, 2010. ↑ "Oklahoma Tower". Emporis Corporation. Retrieved March 16, 2010. ↑ "Sandridge Center". Emporis Corporation. Retrieved March 16, 2010. ↑ "Valliance Bank Tower". Emporis Corporation. Retrieved March 16, 2010. ↑ "Bank of Oklahoma Plaza". Emporis Corporation. Retrieved March 16, 2010. 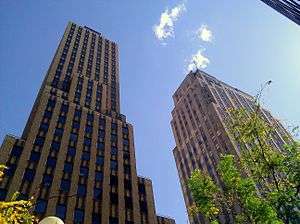 ↑ "AT&T Building". Emporis Corporation. Retrieved March 14, 2012. ↑ "Leadership Square North Tower". Emporis Corporation. Retrieved March 16, 2010. ↑ "Climatological averages and records" NWS Norman, Oklahoma. Retrieved August 22, 2012. 1 2 3 "NowData - NOAA Online Weather Data". National Oceanic and Atmospheric Administration. Retrieved 2013-03-10. ↑ NOAA (2013). "Regional Climate Trends and Scenarios for the U.S. National Climate Assessment" (PDF). p. 58. ↑ "The Great Plains Tornado Outbreak of May 3–4, 1999". National Weather Service Norman Oklahoma. Retrieved May 30, 2013. ↑ "The Tornado Outbreak of May 20, 2013". National Weather Service Norman, Oklahoma. 2013. Retrieved May 30, 2013. ↑ "The May 31 – June 1, 2013 Tornado and Flash Flooding Event". National Weather Service Norman, Oklahoma. 2013. Retrieved June 10, 2013. ↑ Washington Post (May 26, 2015). "After massive storms in Oklahoma and Texas, at least nine killed and 30 people missing". ↑ "Station Name: OK OKLAHOMA CITY WILL ROGERS AP". National Oceanic and Atmospheric Administration. Retrieved 2013-03-10. ↑ "WMO Climate Normals for OKLAHOMA CITY/WSFO AP OK 1961–1990". National Oceanic and Atmospheric Administration. Retrieved 2014-03-11. ↑ United States Census Bureau. "Census of Population and Housing". Archived from the original on May 11, 2015. Retrieved June 8, 2015. ↑ Data Access and Dissemination Systems (DADS). "American FactFinder – Results". census.gov. Archived from the original on March 5, 2014. ↑ "Oklahoma City, Oklahoma (OK) income, earnings, and wages data". City-data.com. Retrieved March 29, 2013. 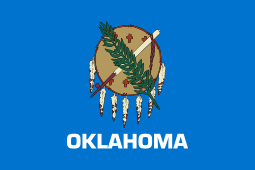 ↑ "Oklahoma City (city) QuickFacts from the US Census Bureau". Quickfacts.census.gov. Archived from the original on March 28, 2009. Retrieved March 29, 2013. 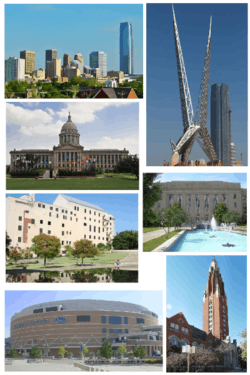 ↑ "State & County QuickFacts – Oklahoma City (city), Oklahoma". United States Census Bureau. Archived from the original on March 28, 2009. ↑ "Results". American Factfinder. United States Census Bureau. Retrieved March 24, 2016. ↑ "Narcotics agents arrest suspected cartel member in Oklahoma City". Newsok.com. June 29, 2010. Retrieved February 15, 2012. ↑ Stover, Jean (2009). Sirloin Stockade Slaughter: Murder on the Run. Durham, Connecticut: Eloquent Books. ISBN 978-1-60860-924-6. ↑ "Fortune 500 2014:Chesapeake Energy Corporation". Forbes. Archived from the original on October 25, 2014. Retrieved November 29, 2014. ↑ "Fortune 500 2014:Devon Energy Corporation". Forbes. Archived from the original on November 29, 2014. Retrieved November 29, 2014. ↑ "Love's Travel Stops & Country Stores". Forbes. October 2014. Archived from the original on October 19, 2014. Retrieved November 29, 2014. 1 2 3 "Oklahoma City MSA Major Employer List". Greater Oklahoma City. July 2014. Archived from the original on November 29, 2014. Retrieved November 29, 2014. ↑ "Oklahoma City: Economy, City-Data.com. . Retrieved January 26, 2010. 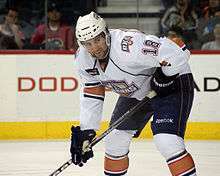 ↑ Joshua Zumbrun (April 29, 2008). "America's Recession-Proof Cities". Forbes. 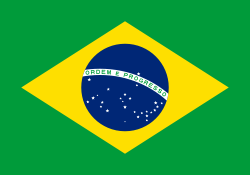 ↑ "Best Places For Business and Careers – Forbes". Forbes. Retrieved January 14, 2014. ↑ "Best Places – #7 Oklahoma City, Okla. – In Photos: Best And Worst Places For Business 2014". Forbes. Retrieved 2015-10-20. ↑ "Business Improvement Districts". The City of Oklahoma City. Retrieved November 29, 2014. ↑ "Special Zoning District Map" (PDF). City of Oklahoma City. Archived from the original (PDF) on December 18, 2014. Retrieved November 29, 2014. ↑ Dale Chihuly: The Exhibition | Oklahoma City Museum of Art Archived April 5, 2008, at the Wayback Machine. ↑ Couch, James D. "Council Agenda Item No. VIII. I. April 26, 2005" (PDF). Memorandum. The City of Oklahoma City. Retrieved July 23, 2012. ↑ Magasmen, Susan (2009). The 10 Best of Everything Families: An Ultimate Guide For Families. Washington, D.C.: National Geographic. pp. 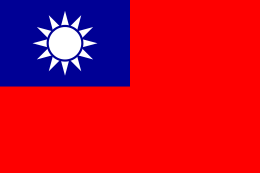 174–175. ISBN 978-1-4262-0394-7. ↑ "OKC Skatepark named one of "Ten Best" in National Geographic Travel Guide". News. The City of Oklahoma City. Retrieved July 23, 2012. ↑ "Mayor and Council", City of Oklahoma City. Retrieved January 27, 2010. 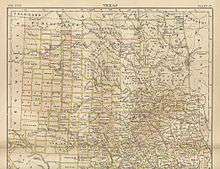 ↑ Oklahoma City responds to David Slane's challenge of MAPS-3, KOKH-TV, September 3, 2013. ↑ "(OKC) District's enrollment growth a tale of demographic shifts" (ASP). Daily Oklahoman. November 6, 2009. Retrieved November 6, 2009. ↑ The Top of the Class 2008, Newsweek, May 17, 2008. (Retrieved April 28, 2010). Archived August 9, 2010, at the Wayback Machine. ↑ Belle Isle Enterprise Middle School (Retrieved January 26, 2010). Archived September 5, 2008, at the Wayback Machine. 1 2 Oklahoma Fast Facts and Trivia. Retrieved January 26, 2009. ↑ City of Oklahoma City | Fire Department. Okc.gov. Retrieved on July 21, 2013. ↑ "Wiley Post Archived October 8, 2012, at the Wayback Machine. ", U.S. Centennial of Flight Commission. Retrieved February 1, 2010. ↑ Current Statistics, Will Rogers World Airport . Retrieved February 1, 2010. ↑ "Trauma Centers". American College of Surgeons. ↑ INTEGRIS Cancer Institute of Oklahoma. ↑ Todd Stogner. "Oklahoma Hospital, Health Center & Clinic Locations – INTEGRIS OK". integrisok.com. 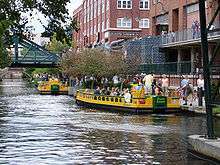 ↑ Best Places to Live in Oklahoma City, Oklahoma – Health (Retrieved May 6, 2010). ↑ "ACSM American Fitness Index Ranks 50 Largest Metro Areas on Health And Community Fitness". 2009. Archived from the original on July 5, 2010. Retrieved May 26, 2010. ↑ "Oklahoma City, OK MSA 2010 AFI Report" (PDF). Retrieved May 26, 2010. 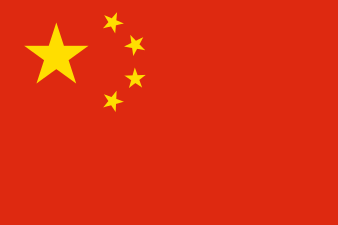 ↑ "Sister Cities Haikou-Oklahoma City" (PDF). 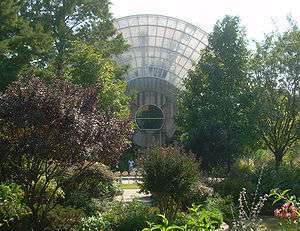 sister-cities.org.